These fine-jaw tipped pliers can be used for a variety of applications. 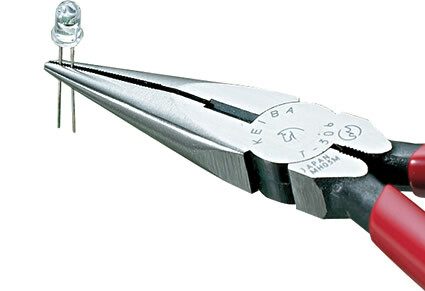 They are designed for heavy-duty use and are appropriate for critical applications. Serrations in the jaw area are designed for crimping or removing vinyl wire sleeving. Heat-treating of the jaw area of these pliers is carefully designed to provide high strength without brittleness. These long-nosed pliers are of the highest quality and have already gained a strong reputation both in the Japanese domestic and overseas markets.